With these words, Dr. Vladimir Gashinsky of the Holistic Dental Center in Millburn, New Jersey, introduced the latest in dental relaxation technology: NuCalm Therapy. Dr. Gashinksky is one of the first dentists to introduce this new therapy in New Jersey. With its 100% natural ingredients and gentle approach, NuCalm achieves deep relaxation through four simple steps. It is administered by the dental team at the beginning of the patient’s appointment. Most patients already then experience deep relaxation within 3 to 5 minutes. While listening to soothing music, the patient relaxes comfortably in the dental chair for the entire appointment. Once the appointment is completed, the patient can leave the office immediately with no side-effects, no impairments and no recovery time. To date over 300,000 dental patients across the country have experienced a relaxing dental appointment with NuCalm, while 98% of patients who have experienced NuCalm stated they would recommend it to their friends and family. 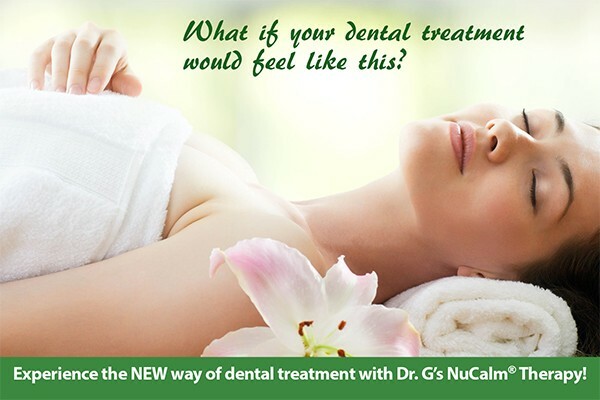 Dr. Gashinksky offers a free NuCalm session for any patients who want to experience for themselves what this breakthrough therapy can do for their dental health.